Cocaine Addiction Help: Is Recovery Even Possible? 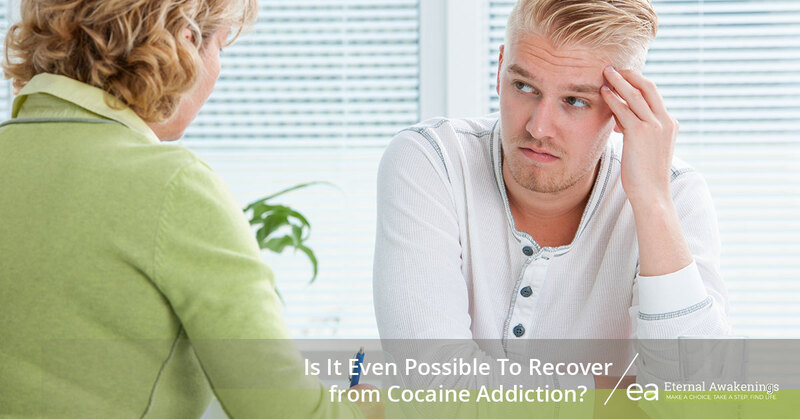 Is It Even Possible To Recover from Cocaine Addiction? Most people who become addicted to cocaine will need help to get away from it. Cocaine addiction is powerful, and if you let it, it will rob from you. One by one, the things that are precious to you in life will begin to be stripped away. Close-knit relationships with your loved ones. Your ability to hold down a job. Your brain’s ability to correctly process chemicals. As with any drug, the pleasure the drug offers is a fraudulent source of help for what you’re going through. It says to you, “Here, I can give you a moment of euphoria and bliss so that you can escape the pain of what you’re feeling.” But what you don’t see is all the destruction that follows after that. The pain multiplies faster than the relief. The drug takes more than it gives. But try as you might, you can’t seem to escape. What do you do when the same exact brain that you use to think, “I want to stop this,” is also the one that sabotages your best thoughts with unstoppable cravings? Is it even possible to escape that addiction? It is possible. There is hope. You can be free. Here at Eternal Awakenings (EA), we have seen not just one or two, but many people over the years, who successfully escaped their addiction and stayed sober. And we want that same thing for you. What does it take to recover from cocaine addiction? You have to want to quit. If it’s not you choosing and wanting this, your mind will just be dwelling on how you can get an opportunity to use again. Seek professional help. If you try to quit on your own, your chances of a relapse are greater. For instance, a residential rehab program like the one at EA can give you the supportive environment that you need to pass through the crucial initial stage of walking away from your addiction. Identify your triggers, and take measures to protect yourself from the events that are the most likely to cause you to relapse. Learn about freedom in Christ. Cocaine addiction is not the only thing that one side of your brain says “yes” to while the other side says “no.” There are many things of this nature, and the Bible proclaims that there is freedom, victory, and triumph for whatever area you’re struggling with—even the strongest ones. Learn how to deal with impulsivity. Cocaine addicts tend to have a pattern of highly impulsive behaviors, which tends to get them into trouble. You might have a brain that wants to be impulsive, but there are techniques that you can employ to stop yourself from carrying out those knee-jerk reactions every time. Abstain from other addictive substances. If you stop using cocaine, but still allow yourself to have something like alcohol or marijuana, you increase your chances that you’ll relapse with cocaine. What do you do with a brain that wants two opposite things at the same time? If you just try to wield your brain against itself, you’ll go around and around in circles. You’ll be like a tree trying to pull itself up by the roots. But if you get outside help, you’ll have something larger than your brain to lift you up, strengthen you in the right path, and support you towards recovery. You need someone who knows what it takes and who will support you all the way. There is much more that we could share in detail about your cocaine recovery. However, it’s one thing to read about recovery and another thing to actually experience it. Why not come to Eternal Awakenings to find out for yourself what it looks like to find true healing, hope, and restoration? Our rehab program is here to walk with you in the pursuit of your complete and lasting freedom from your addiction. Contact us today to find out more about our program or to start the enrollment process.